After various campaigns alleging then-current Melbourne Lord Mayor John So of frivolous spending and unnecessary overseas trips, newly elected Lord Mayor Robert Doyle has proposed a costly peace-keeping mission to Russia. Mr. Doyle was elected to the position in early December, and almost immediately caused scandal by vowing to allow only buskers with a certain degree of talent to perform on Melbourne streets. Now newspaper headlines claim that Mr. Doyle is planning a trip to Russia, apparently in order to avert a cold war from being launched against the city of Melbourne. Although Mr. Doyle vowed in election promises to avoid costly overseas trips, figures released by Town Hall show the Russian expedition to cost $47,000. Lord Mayor Doyle justified his expenditure with the release of email conversation between Australia's ambassador to Russia, Margaret Twomey, and Australian honourary consul in Russia, Sebastian Fitzlyon, warning of 'dire consequences' if the Lord Mayor did not attend the 20th anniversary celebrations of St. Petersburg and Melbourne's sister-cityship. 'This would have negative and sad ramifications in my view...' warned an email from Mr Fitzlyon. Barack Obama (formerly Baracké Ubama) was today sworn in as the forty-fourth President of the United States of America in a lavish ceremony which lasted for hours, visibly boring Obama’s daughters, Malia and Sasha. The ceremony included a drawn out concert featuring acts including 1995 Grammy Award winners U2, Sheryl Crow and Bruce Springsteen, as well as Beyoncé and will.I.am. After a campaign in which ballot papers bore the name ‘Barack Osama,’ and interview subjects on 60 Minutes declaring that ‘Barack Hussein Obama is not an American name,’ thousands turned out to celebrate the inauguration. 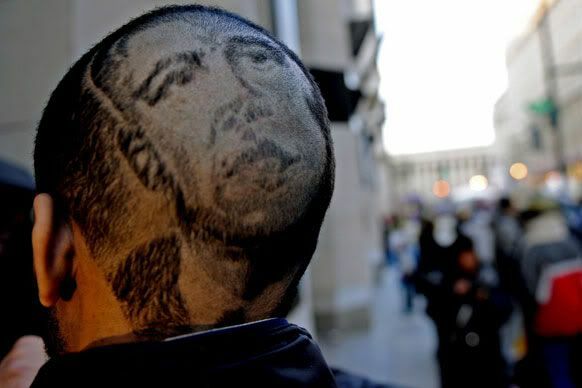 Alan Freeman of North Carolina was so inspired by Barack’s impending presidency that he sported a likeness of Mr. Obama on the back of his skull (pictured below.) It is unclear whether the anomaly was naturally occurring or an intentional style. Locally, followers of Obamerama were able to view the parade and ceremony on public screens throughout the country, and special attention was given to Michelle Obama after a local cosmetics company boasted that they were providing exclusive make-up tips for the first lady during the ceremony and ensuing ball. For the Obama daughters, more exciting than the tiring day of ceremony was the repeated promise of being awarded a puppy by their parents when they move into the White House. However, the publicised search of animal shelters has been delayed by Malia’s allergies to certain breeds of dog. 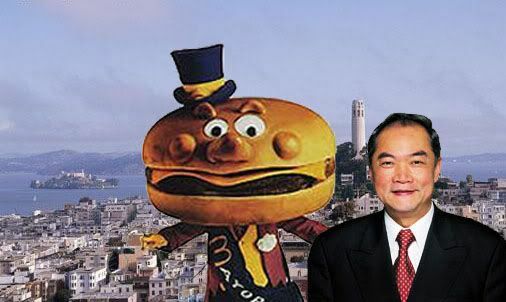 Hours after the parade and ceremony, doctored photographs and rumours were yet to emerge, in contrast to the string of such sensationalism surrounding Mr Obama’s political campaign. 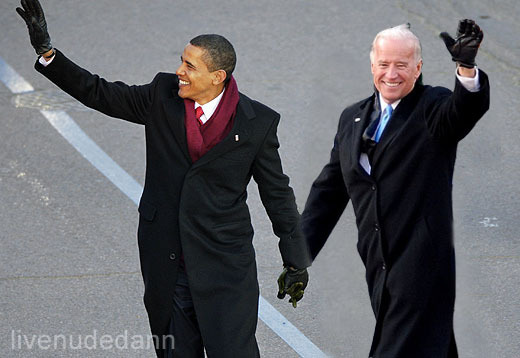 As such, LND.com can show this exclusively doctored image, showing Mr Obama and Vice-President Joe Biden walking the parade route. No Links at this time.